It's a scene that has been repeated countless times on the thoroughfares of cities throughout the Western world-from Hollywood Boulevard and Fifth Avenue in America, to London's Oxford Street and the Champs Elysees in Paris. There, in the midst of traffic, shops, restaurants, and movie theaters, people suddenly find themselves confronted by a group of young persons singing and dancing to the beat of cylindrical drums and the brassy cadence of hand cymbals. The men are dressed in flowing robes and have shaven heads; the women wear colorful Indian saris. Of course, it's the Hare Krsna people, chanting their now familiar mantra, Hare Krsna, Hare Krsna ... But what's actually going on? Is it some form of protest, avant-garde street theater, a religious demonstration, or what? If you were to ask them, you'd learn that these people are performing a type of meditation long encouraged and practiced in the West-the chanting of the holy names of God. (Krsna is the Sanskrit name for the Supreme Lord.) Of course, meditation is a word that's thrown around quite loosely these days. It's come to mean practically any technique employed to silence and calm the harried modern mind. But the ancient and authorized form of meditation practiced by Hare Krsna people has a much deeper and more sublime purpose. Although it easily soothes the turbulent mind, it also awakens those who chant it to their original, joyful spiritual nature and consciousness, imparting a genuine sense of pleasure unavailable by any other means. The Greek philosophers Socrates and Plato held a view of man's original nature quite similar to that of the Vedic sages. This temporary world, they taught, is not our real home; we once existed in a spiritual world. In Plato's famous dialogues, Socrates says that in our original condition, "We were pure ourselves and not yet enshrined in that living tomb which we carry about, now that we are imprisoned in the body like an oyster in his shell [Phaedrus, translator Benjamin Jowett]. The purpose of philosophy, for these early Athenian thinkers, was to awaken a person to his original, spiritual identity, now hidden within the covering of the physical body. But what is the "requisite stimulus" for awakening the dormant consciousness of the self and God that lies within everyone's heart? All genuine spiritual authorities agree that such transcendental experiences cannot be awakened by any material stimulus or experience, including ingestion of chemical substances like LSD and other "mind-expanding" drugs. And the Bible is replete with similar statements. In the Old Testament it is said, "The name of the Lord is a strong tower: the righteous runneth into it and is safe." [Proverbs, 18:10] In Psalms, King David proclaims, "l will praise the name of God with a song." [Psalms, 69:30] Indeed, the Psalms contain countless references to the name of God: "All nations whom Thou hast made shall come and worship before Thee, O Lord: and shall glorify Thy name. [Psalms, 86:9]... O give thanks unto the Lord: call upon His name: make known His deeds among the people. Sing unto Him, sing psalms unto Him: talk ye of all His wondrous works. Glory ye in His holy name. [Psalms, 105: 1-4] ... Praise Him with the timbrel and dance: praise Him with stringed instruments and organs. Praise Him upon the loud cymbals." [Psalms, 150:4-5] The prophet Isaiah described God as "One that inhabiteth eternity, and whose name is Holy." [Isaiah, 57:15] Centuries later, Israel Baal Shem Tov (1699-1761), the great Jewish mystic, founded Hasidism, a popular pietist movement within Judaism, in which members dance and chant in glorification of the Supreme Lord. In the early Christian churches, there was, according to the historian Eusebius, "one common consent in chanting forth the praises of God." [Ecclesiastical History] The Gregorian chants, popularized in the sixth century by Pope Gregory the Great and later by works like Handel's masterpiece the Messiah, with its resounding choruses of hallelujah ("praised be the Lord"), are still performed and appreciated all over the world. Among the followers of Islam, the names of God (Allah) are held sacred and meditated upon. According to tradition, there are ninety-nine names of Allah, called "the Beautiful Names." They are found inscribed on monuments such as the Taj Mahal and on the walls of mosques. These names are chanted on an Islamic rosary, which consists of three sets of thirty-three beads. Worshipers repeat the names to help them concentrate their minds upon Allah. The dual titles Al-Rahman, al-Rahim, meaning "God, the compassionate, the merciful," are invoked at the beginning of each chapter of the Koran. Other Arabic names of God glorify Him as the creator, provider, and king. "Rosaries are widely used in Buddhism; large ones by monks, smaller ones by the laity, says Geoffrey Parrinder, a professor of comparative religion at the University of London, in his book Worship in the World's Religions. "The large ones have 108 beads, the two halves representing the fifty-four stages of becoming a boddhi-sattva (enlightened one). The large bead in the middle stands for Buddha." Members of Japan's largest Buddhist order, the Pure Land sect, practice repetition of the name of Buddha (namu amida butsu). The founder Shinran Shonin says, "The virtue of the Holy Name, the gift of him that is enlightened, is spread throughout the world." [Buddhist Psalms, Yamabe, S., and Beck, L.A. Murray, 1921, p. 86] The Buddhist teachings reveal that by chanting the name of Buddha, the worshiper becomes liberated from the cycle of reincarnation and joins the Buddha in the Pure Land, or spiritual world. 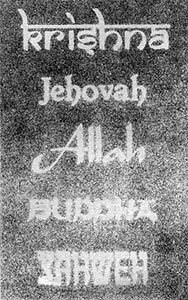 Although God is known throughout the world by many different names, each of which describes some particular aspect of His glories and attractive features, there is one name which expresses the sum total of God's infinite qualities and characteristics This supreme, all-encompassing, and most powerful name of God is found in the oldest religious scriptures in the world, the Sanskrit Vedas of India, which state that the principal name of God is Krsna. The spiritual qualities of Krsna's holy name are described throughout the Vedic literatures. The Padma Purana states, "The holy name of Krsna is transcendentally blissful. It bestows all spiritual benedictions, for it is Krsna Himself, the reservoir of all pleasure.... It is not a material name under any condition, and it is no less powerful than Krsna Himself. Since Krsna's name is not contaminated by the material qualities, there is no question of its being involved with maya [illusion]. Krsna's name is always liberated and spiritual; it is never conditioned by the laws of material nature. This is because the name of Krsna and Krsna Himself are identical." The Kali-santarana Upanisad specifically recommends the chanting of the Hare Krsna mantra: "Hare Krsna, Hare Krsna, Krsna Krsna, Hare Hare/ Hare Rama, Hare Rama, Rama Rama, Hare Hare-these sixteen names composed of thirty-two syllables are the only means to counteract the evil effects of Kali-yuga. In all the Vedas it is seen that to cross the ocean of nescience there is no alternative to chanting the holy name." Lord Caitanya's biographers record that He spent many years traveling all over India spreading the chanting of the holy names of Krsna. He chanted the Hare Krsna mantra congregationally (kirtana) to the accompaniment of musical instruments, including drums and hand cymbals. The Lord also chanted the mantra quietly a specific number of times daily as a private meditation (japa). In the Siksastaka, His famous prayers about the holy names of Krsna, Lord Caitanya wrote, "Let there be all victory for the chanting of the holy name of Lord Krsna, which can cleanse the mirror of the heart and stop the miseries of the blazing fire of material existence. That chanting is the waxing moon that spreads the white lotus of good fortune for all living entities. It is the life and soul of all education. The chanting of the holy name of Krsna expands the blissful ocean of transcendental life. It gives a cooling effect to everyone and enables one to taste full nectar at every step." Bhaktivinoda's vision became a reality in less than a century. In 1965, India's greatest spiritual and cultural ambassador, His Divine Grace A. C. Bhaktivedanta Swami Prabhupada, arrived in New York's East Village, the heart of the countercultural movement of the sixties. Within a year Srila Prabhupada, tenth in the line of spiritual masters from Lord Caitanya, had founded the International Society for Krishna Consciousness. Very quickly, the sound of the chanting of Hare Krsna spread, first across America, then on to England and throughout the world.